I get energized everytime I make Raw Energy Bars at home. I have tried several recipes and flavors before; but, this Chocolate, Cashew, and Almond flavor is currently my favorite! It's made from scratch using raw ingredients, such as Medjool dates, cashew, almond, cocoa, and coconut. You will be amazed with the end result. Not only are these bars good for you, they also taste great! 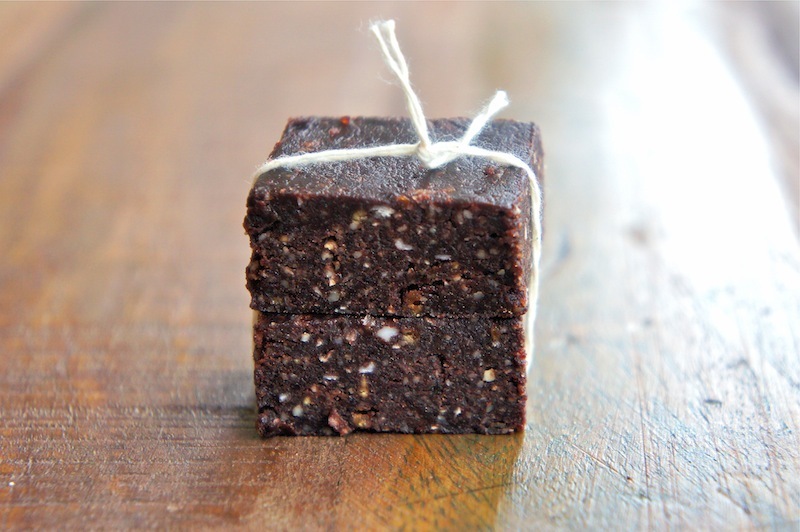 So, if you are into raw energy bars, then you may want to try this recipe. If possible, please send me your feedback as well. Have a great weekend. Thanks for sharing the recipe. Those bars are very expensive at the store. great recipe. i think it'd also be good to mix in some vegan protein powder or spirullina for an extra health boost! bookmarked this with my cookmarked.com account! @Anonymous: Thanks for the suggestion. Looks beautiful! I've made these without the choccolate and in little balls before. This is definitely happening next time- can't resist the chocolate, thanks!! I can tell by looking that I would just love these! unfortunately, I can't seem to find moist Medjool dates around here. wonder if the dried out ones would process almost as well? definitely, definitely will be revisiting this recipe. thanks so much! You can soak half the dates in water for an hour to provide moisture if your dates are really dry. This works with any dried fruit. What a great recipe! Congrats on the Top 9 today! @Dmarie: You can soak the dried dates with water for an hour, or until they soften before you process them. I just made these and they are AMAZING! I don't have access or the funds for medjool dates, so i just used the ones i could find (as long as they had no added sugar)and soaked them for an hour to plump them up. I also used dark cocoa powder because thats all i ever have on hand, and added a tablespoon of agave to sweeten it a litte. DELISH! I cut them up into 8 bars and wrapped them up and threw them in the fridge. Now i have pre workout snacks for the whole week! Thanks! Next time i'm going to use less cocoa since I use dark and mix in some chia and hemp seeds at the end. Thanks for the great recipe! I'll be making this weekly. @Bethany: Fantastic! I am glad you like the bars. I like the idea of adding some Chia and hemp seeds too. I will try it next time. Thanks. i made something similar tonight with 1 cup almonds, 1 cup dates (any kind), 4 T special dark cocoa, 1 t vanilla extract. soo tasty. i can't stop eating them. going to try your recipe next. I made these a few days ago and now I grab one for breakfast on my way out the door in the mornings. They're so good! I love that there's no oil or anything but yummy goodness in here. I posted my tweaks on my blog (with several links back to you, of course). Thank you for sharing! @Anna: That's fantastic! Thanks for the link, and it's good to know that you enjoyed the bars. How long will these keep for in the fridge? so so tasty!! i have just started and raw food diet and was getting VERY bored of plain, single food. but these are AMAZING!!! So good! I didn't have cashews so I used pumpkin seeds & sunflower seeds, as well as Hemp protein powder & a banana too plus chai seeds!!! Yum!! Can I use almonds with the skin on? Thanks for this yummy sounding recipe!! Going to try very soon!!! I made #2 today, and doubled the recipe. I had to sub half the dates for raisins. They turned out nicely! The only thing is that they are a little sticky on the surface. But, they are all individually wrapped in plastic, so one can hold them that way and not messy the hands. Thanks! Do you have the calorie count for this bar? Sorry, I don't have the calorie count but will post it once I have it. Thanks for your comment. How about a complete nutritional break down? I am diabetic and would like to know the carbohydrate and fiber contents as well. Thanks! Waiting for these bad boys to come out of the fridge. I'm so excited! Please get your fact right before you start accusing people! The recipe is mine, and I have asked them to remove from their website, which they did. I hope you learn a lesson from this, don't jump into conclusions, do your homework! FYI- the other recipe is good too. Hey Angie, I tried these at home and everyone loved them. The recipe stayed sticky and clings to the foil. Had to eat them with a spoon. Could you tell me what could have gone wrong? I guess the mixture might be too wet. It should be sticky enough to hold the dough together. Maybe reduce the water, or add extra almond, and lined the tin with plastic wrap. Hope this help, and thanks for trying the recipe. Love these! My first time making anything with dates. 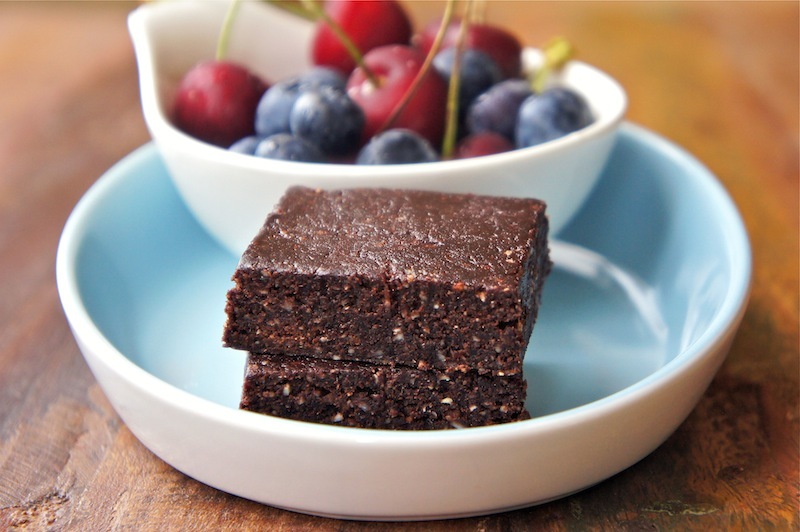 They're like delicious energy brownies without the guilt. I've added in different kinds of nuts and it has always come out fantastic. Thank you so much for sharing. I've made these 2x now since finding your recipe, they are so good! I am out of coco or I would be making another batch right now! I have found that using homemade vanilla extract from vodka and vanilla beans tasted much better than the extract from the store, much less alcohol-ly taste. The first time I also added some sunflower seeds and those were really tasty as well. I read some of the previous posts and did not find a problem with sticky-ness. I agree, probably too much water in the mix. Fantastic! I'm glad you like the recipe and thanks for the feedback. I was about to make the recipe but sat down to do a calorie count and found that the batch is a total of 2950 calories, which works out to 369/bar for 8 bars.I am trying to lose weight and have to deal with diabetic issues, so I need to make these a bit more user friendly. Any suggestions? My first thought is to change the cashews... Thanks! Hey Les Walsh, I'm not sure if you swap cashew with other nuts will change the calories. Thank you for the calorie count...I am thinking that you may want to use it as a quick snack and cut down your meals throughout the day...I will be using it at work as a meal replacement..I am also dieting and if you are active throughout the day you can add a few calories to your meal plan...That is how I look at it...I am going to make them today and shared your recipe on my facebook for others to try as well..they sound delicious and better than the store bought which i find extremely sweet. Thank you for sharing your recipe.. These were so great! Thank you so much! My boyfriend is a super picky eater when it comes to healthy food. I like the fact that most of the ingredients he isn't fond of are pulverized, so he would never know the difference. Sometimes you have to trick those silly picky eaters. I can't wait to try this recipe out, they look delicious! Thank you for sharing! Amazing! Thanks! This is the first time I have tried making anything like this. I think they might also be nice with dried figs instead of dates... Might need to soak the figs a bit first to get them sticky though. Crunch on!! do not try to make these in a Vitamix. They just get all crammed in the bottom! I made them in my Kitchenaid and they turned out wonderfully! I added cocoa nibs and then pressed hemp and flax seeds on top!! absolutely delicious! Hello, I just tried your energy bars today and they are fantastic! We'd love to post them on our blog site plant-based4health.com. Would that be alright? Thanks so much for your consideration and your wonderful recipe! I'm glad the bars turned out great for you. Yes, you can post them with the recipe link on your blog. Thanks for the feedback and comment. I made these last night and am enjoying one now. Fantastic recipe and so easy. I used coconut water and added 2 tablespoons almond butter. Also melted about 1/2 cup 85% cacao chips and spread a thin layer on top. Meant to add chia and flax, but forgot. Absolutely delicious recipe with so many possibilities... THANK YOU ! I'm okay with it and thanks for the link. Just made with equal parts chopped medjool dates, prunes and cranberries and turned out great. Medjool dates are more expensive so I did this as a budget recipe and equally delicious. Not as good as I thought they would be, a bit too high cal for me atm. Made these tonight. They taste great and will take some with me on my bike ride tomorrow. Any idea how long I can keep them in the fridge. Or can I freeze them. Would love to know as making lots and freezing sounds like a good idea. Absolutely amazingly delicious! So hard to believe there is no sugar in them, only the dates!! I made them into little balls and must admit that I'd prefer them to any truffle or candy bar any day! Thank you very very much!! Best snacks for nursing moms! Energy dense, store well in the freezer, and they can be eaten with one hand. My sister brought over a batch when I had my first child, and I made two batches for the freezer as I wait for baby #2. Thanks for the recipe.